As we head into the September School Holidays it is an appropriate time for our community to reflect on the many educational opportunities of the past term and the wonderful learning experiences offered to our students across PK-12. These opportunities range from the many classroom activities organised by our staff, to the assorted excursions, carnivals, Primary School swimming lessons and community events that have occurred. Staff across the School have worked tirelessly to ensure the best possible learning opportunities for your children. These opportunities have occurred both inside and outside the classroom and on planned excursions, requiring the commitment, dedication and enthusiasm of the staff to organise. I am very grateful to the staff for their unwavering commitment to ensuring the best possible educational experiences for all children that attend PMACS. It undoubtedly a time of mixed emotions for our Year 12 students as they contemplate the end of their journey as a student here at Peter Moyes Anglican Community School. There will be a sense of excitement, anticipation, joy and perhaps even a tinge of sadness, particularly for those students who have completed their entire schooling here at PMACS. We are looking forward to saying farewell to our departing Year 12’s in style, with a number of events scheduled for early next term, including the Valedictory Assembly. I would like to wish all of our Year 12 students the very best for their upcoming exams. The finishing line is fast approaching and it is my hope that you can maintain your focus for just a little bit longer to ensure you have the best chance of success throughout the exam period. Week 8 of Term 3 marked ASC Schools Week with a number of events held to commemorate the occasion. On Wednesday 5 September, a Eucharist Service was held in St George’s Cathedral. Representatives from all 14 ASC schools were present. Students from PMACS played a prominent role in the service, with a performance from over 20 students across Primary and Middle School a special highlight of the event. The fifth ASC Combined Schools’ Concert was held at the Perth Concert Hall on Friday, 7 September. It was a spectacular event involving all the ASC schools and included combined Orchestra, Choir, Concert Band, Stage Band, Rock Band, and String Orchestra. PMACS students performed in all of these ensembles. The students and staff involved showed tremendous dedication in preparing and rehearsing for the event. One particular student, Amy Croker, performed in most groups and was on stage for the majority of the concert. I was also very impressed with the PMACS Vocal Ensemble who, along with members of Muzomix, performed two songs in the combined Rock Band. Year 9 student Atidasihe Gohwa produced a particularly noteworthy solo performance, singing “Proud Mary” by Creedence Clearwater Revival with much energy and musicianship. Recently, Primary School students have been involved in the State Finals for Tournament of Minds (TOM). Tournament of Minds is a problem solving competition for teams of students from both primary and secondary years. The tournament's aim is to enhance the potential of students by developing diverse skills, enterprise, time management, and the discipline to work collaboratively within a challenging and competitive environment. I am proud to report that our Primary students won the State Finals for the STEM component of the competition and will now be heading to Darwin to represent Western Australia in the National Finals. This is the first time that PMACS students have reached this stage of the competition and I wish our participating students the best of luck. I also extend sincere thanks to Chrissie Payne, Primary Academic Extension Teacher, for her dedication and enthusiasm in assisting the students get to this point. During Week 9, Middle School students participated in two special events to recognise the importance that role models can play in supporting young people. Year 9 girls attended a special Afternoon Tea, an opportunity to gather with their peers and the significant women in their lives. While enjoying some tasty treats, the girls were motivated by guest speaker Ashlee Harrison, CEO and Founder of zero2hero. Ashlee is on a mission to increase awareness of mental health issues in young people and reduce the rate of youth suicide in our country. As a former young Western Australian of the year, Ashlee provided an engaging address to our Year 9 girls on the benefits of developing resilience and overcoming the challenges in our lives if we are to learn and grow. Not to be left out, the Year 9 boys had the opportunity to attend a ‘Male World’ Breakfast and hear from Father Gift Makwasha. 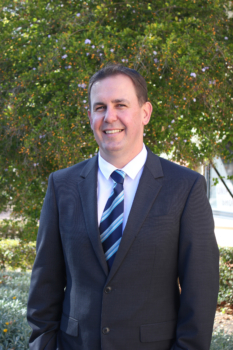 Father Gift is a member of the School Council for Peter Moyes Anglican Community School and prior to joining our community, he has experienced a very diverse life lived across three continents. Father Gift shared some of his journey with our Year 9 boys and the significant men in their lives, encouraging them to ‘soar like eagles’ and to take action and not make excuses. In concluding, I would also like to wish all staff and families a wonderful holiday and would trust that you find the time to enjoy the company of your family and friends over the upcoming holiday period.